Make the most out of your tournament travel by adding a Starfire Sports tournament to your summer plans. Our tournament packages are geared towards teams traveling from out of state who are looking for a 7-10 day soccer experience. Our Spring Classic and Sounders FC Cup are on weekends that align with other regional tournaments to allow for two consecutive tournament weekends, and our travel packages fill the week between tournaments with great soccer opportunities. 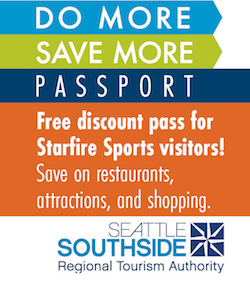 In addition to the packages below, we offer complimentary concierge services courtesy of Seattle Southside Regional Tourism Authority for organization of college campus tours, restaurant reservations, hotel bookings, and activity planning services for a full slate during your stay. Please note that packages do not include tournament registration fees or travel costs.